1In a heavy bottomed medium saucepan, bring the milk, water, butter, sugar and salt to the boil. 3Transfer the dough into a bowl of a mixer fitted with the paddle attachment, or using your handmixer or if you still have the energy, continue by hand. Add the eggs one at a time, beating after each egg has been added to incorporate it into the dough. You will notice that after you have added the first egg, the dough will separate, once again do not worry. As you keep working the dough, it will come back all together again by the time you have added the third egg. In the end the dough should be thick and shiny and when lifted it should fall back into the bowl in a ribbon. 4The dough should be still warm. It is now ready to be used for the éclairs. 5Preheat your oven to 375F. Divide the oven into thirds by positioning the racks in the upper and lower half of the oven. Line two baking sheets with waxed or parchment paper. 6Fill a large pastry bag fitted with a 2/3 (2cm) plain tip nozzle with the warm cream puff dough. (Alternatively, you could use a heavy-duty ziploc bag and snip a chunk off the corner to squeeze the batter out.) Pipe the dough onto the baking sheets in long, 4 to 41/2 inch chubby fingers. Leave about 2 inches (5 cm) space in between each dough strip to allow them room to puff. The dough should give you enough to pipe 20-24 éclairs. 7Slide both the baking sheets into the oven and bake for 7 minutes. After the 7 minutes, slip the handle of a wooden spoon into the door to keep it ajar. After 5 more minutes, when the éclairs have been in the oven for a total of 12 minutes, rotate the sheets top to bottom and front to back. 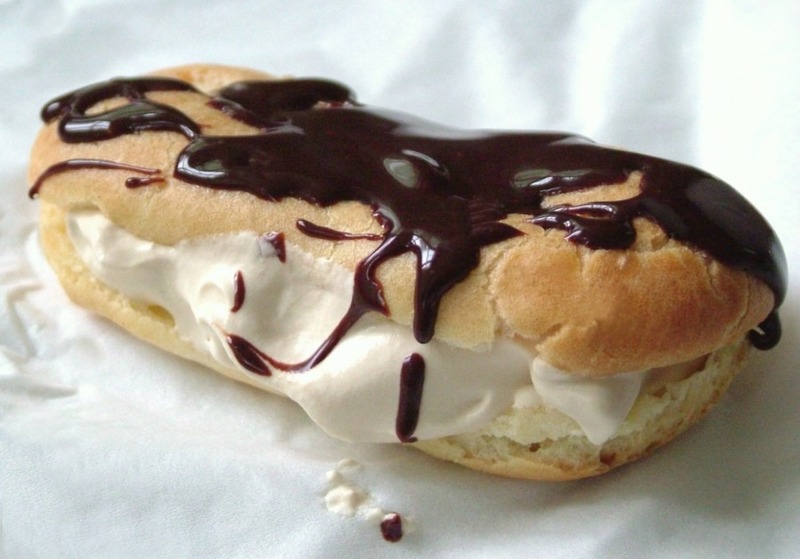 Continue baking for a further 8 minutes or until the éclairs are puffed, golden and firm. The total baking time should be approximately 20 minutes. 9To make the mascarpone cream, beat the mascarpone, sugar, espresso and vanilla with an electric mixer. Add 1/2 cup cream; beat until soft peaks form. Add the rest of the cream and beat until thick and stiff. Cover and chill for at least 1 hour or up to 5 hours. 10To make the chocolate glaze, bring the cream to a simmer in a saucepan; take it off the heat and stir in the chocolate and honey. Let it sit to allow the warmth of the cream to melt the chocolate, stir until smooth and use immediately. 11To assemble the éclairs, slice the pastries horizontally, using a serrated knife and a gently sawing motion. Set aside the bottoms and place the tops on a rack over a piece of parchment paper. 12The glaze should be barely warm to the touch and spreadable. Spread (or drizzle) the glaze over the tops of the éclairs using a metal icing spatula. Allow the tops to set and in the meantime fill the bottoms with the pastry cream. 13Pipe or spoon the pastry cream into the bottoms of the éclairs. Make sure you fill the bottoms with enough cream to mound above the pastry. Place the glazed tops onto the pastry cream and wriggle gently to settle them.